Through November our shelves groaned with the weight of English Apples and Pears and colourful Crab Apple branches decorated the arch. Pumpkin Squash varieties increased and nutty-flavoured Fenland Celery arrived for its short season. A touch of early frost brought good flavour to Cabbages but we were happy too for the warmth of Italy where our Persimmons and Pomegranates had been grown. 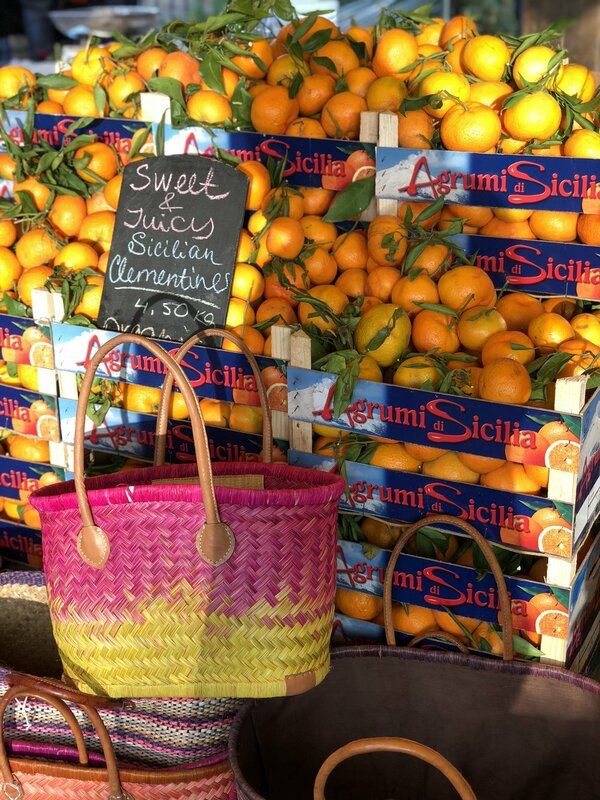 Just arrived and filling the arch with zesty, festive aromas is our Citrus delivery from Italy. Novelino Oranges are now perfectly sweet and juicy; the earlier delivery was a little underripe for our taste. We have our first, and only, delivery of new season unwaxed Sicilian Pink Grapefruits. These are pretty special as it is difficult to find unwaxed Grapefruits in the UK. The skins make the most delicious candied peel. Get them while you can. We have sweet, juicy Nova Clementine Mandarins too. In our opinion, a box would make a wonderful Christmas present. 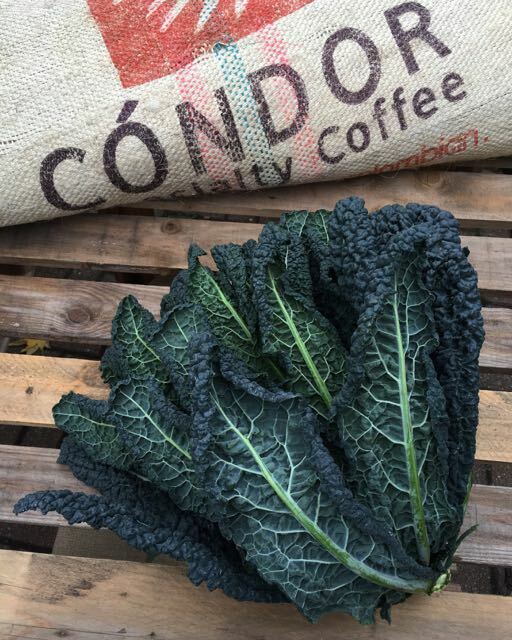 British grown greens are benefitting from the colder weather and we are getting particularly good Cabbages including purple/green hued January King, crinkle-leaved Savoy, juicy Red Cabbage and earthy Black Cabbage/Cavolo Nero. Also expect to find Brussels Sprouts, Sprout Tops and Kalettes. More greens available through to Christmas include Cima di Rapa, and heads of Puntarelle with their juicy centres that are perfect for salads (particularly with anchovies) and beautifully bitter outer leaves for adding to soups and stews. Root vegetable offerings are Parsnips, Swede, Turnips, Salsify and several varieties of Potatoes are here. Carrots too, including easy to prepare baby Heritage and the French Sand-grown Carrots which are sweet and store really well. Silky-textured British Leeks are alongside sweet, flat Sicilian Onions – Cipolla Ramata - that are so good roasted whole. For salads, new season Chicories are arriving, including members of the Endive group like large-leaved Escarole and tight-leaved Belgian Endive along with some of the Radicchio group - Tardivo whose red and white leaves curl into a twist at the top, looser-leaved Treviso and yellow, red-speckled Castelfranco which is the mildest of the bitter-leaved chicories. We have Cranberries, both fresh and dried, Vacuum-packed Chestnuts, Walnuts in their shells and a selection of other Nuts and Dried Fruits. As usual we have a range of Water Kefir flavours in our fridges but, for Christmas, we have created two special edition Water Kefirs available in one-litre bottles. You can choose between flavours of Mulled Wine or Mince Pie, both created with a mix of warming and uplifting natural seasonal spices. We will also have our Cranberry and Chilli Water Kefir available in the run-up to Christmas for those who like their Water Kefir hot! We also have a Fermented Sauce made from fresh and dry cranberries fermented with chilli and garlic. These are worth considering when you are looking for the perfect present for a food lover. Our recipe suggestion this month is the perfect solution to when you just want a little something, rather than yet another big Christmas meal. 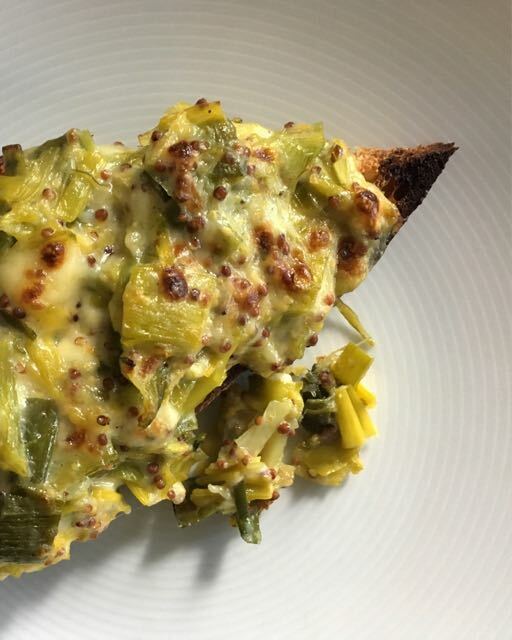 It uses Leeks, which are very much in season, for a delicious take on the dish ‘Welsh Rarebit’. This recipe is based on the one in Rosie Sykes’ The Sunday Night Book which is full of easy, comforting recipes. This one has a kick of mustard to wake up a jaded palate. Trim and cut the leeks into 2cm slices, wash well. Heat the olive oil in a large pan with a lid on medium heat, add leeks, thyme and 3 tablespoons of water, salt and pepper. Stir, cover and cook for 10 minutes or until the leeks are very tender, stirring occasionally to prevent sticking (add a little more water if necessary to soften but you want them just juicy, not watery). Lift out the thyme sprigs and stir the mustard and cheese into the leeks. Toast the bread lightly, both sides. Rub one side with the cut garlic clove. Pile the leek and cheese mixture on top and toast under the grill until it bubbles and starts to brown. We will be open at Spa Terminus Thursday 20, Friday 21 & Saturday 22 December 08.00-13.00 each day.